Local schools are also in need of some larger items, such as furniture, electronic equipment, and playground equipment. These items can be purchased locally. If you would like to contribute for these items or buy them in Chiang Mai, please contact us spicywildpumpkin@gmail.com. The Baan Mai Sa Wan, KhunPoey, Mae Sa Pok schools serve over 100 children from ages 2 through 12 years old. 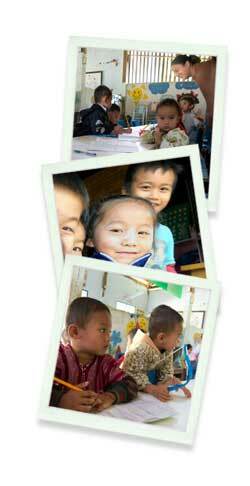 The goal of Project One is to teach English to children from ages 2 through 5 years old in Khunpoey Village. Another goal of this project is to help the kids learn how to live more sufficiently. We hope to educate the children about reusing and recycling resources and starting a veggie plot. The goal of Project Two is to teach English to about 20 kindergarten students in a Karen Village (Mae Sa Pok Village). The goal of Project Three is to teach English to children in a Karen Village (Baan Mai Sa Wan) in Doi Inthanon National Park. This project began in 2008 to help children from ages 5 through 12 years old. Currently, there are 35 students being taught by Samart’s nephew, Eakchai.